A few days ago, Mike Morrison published a 20min video explaining the major flaw in current research poster design and offering an alternative. The video is totally worth a watch for everyone going to conferences and presenting at or attending poster sessions. 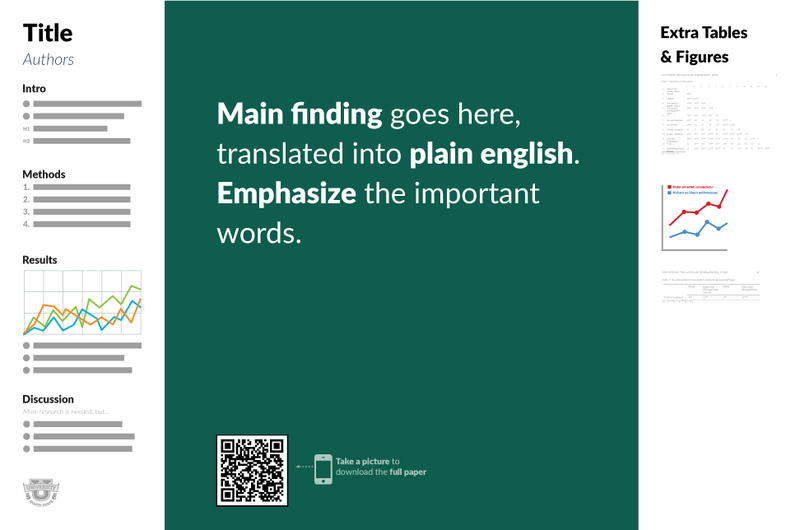 The reasoning is straightforward: In the middle, there is the most important conclusion – presented in a simple way so attendees can easily get the gist when they walk past your poster – as most people do in poster sessions. If they are interested, there’s what Mike refers to as silent presenter bar on the left. They can read the main points from introduction through discussion by themselves. If they want to get more detailed insight, they can of course talk to you (as usual) and you can support your argument with some plots or figures (or any other details) from the right bar. If they are afraid of talking to you, they can snap the barcode and get linked to a full version of the poster (or essay) including all relevant information. Mike does not talk about how he envisioned the barcode link to be used, which I find is important. My suggestion is, to put up details on a site like ResearchGate, so that people not only get the full poster, but can also easily connect with you to stay updated.